The beautiful adult beetle that we know so well has an immature larval form that appears beastly at first glance. This striking difference in life stages is representative of complete metamorphosis: egg, larva, pupa, adult. Butterflies, and the larval caterpillar stage, are another insect group with complete metamorphosis. So, when you see this beast, let it be. 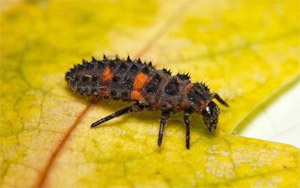 It's eating aphids on your plants.